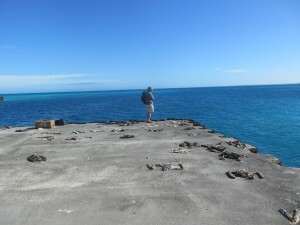 In January I was extremely lucky to accompany my former PhD advisor, Scott Shaffer to Midway Atoll National Wildlife Refuge in the Papahānaumokuākea Marine National Monument as part of my job as a postdoc working in Rob Suryan’s Seabird Oceanography Lab. We were there with the dual purpose of GPS tracking Laysan and Black-footed albatrosses as part of Scott’s long-term research and to collect fine-scale data on flight behavior to develop collision risk models for wind energy development (in other areas of the species ranges such as Oregon). 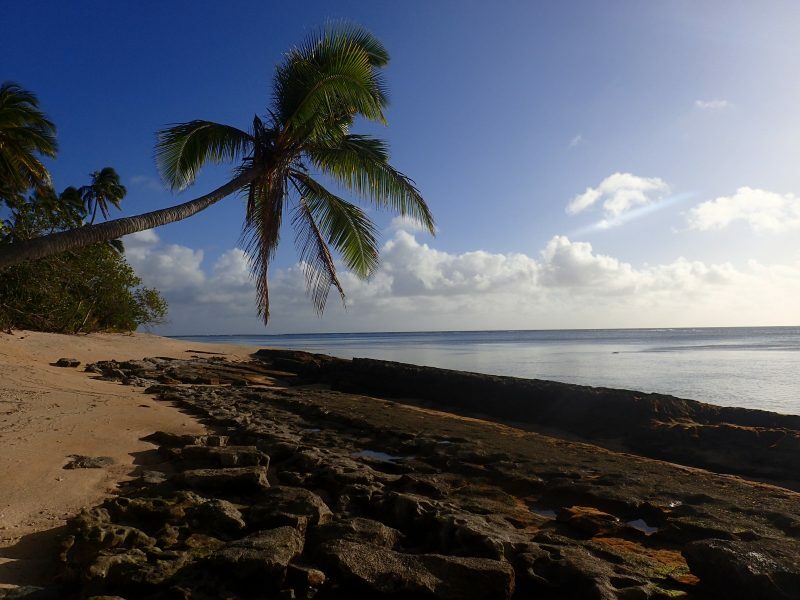 Here are my impressions of this amazing island. So many albatrosses! Our approximately four hour flight from Honolulu to Midway landed at night and as we stood around on the dark tarmac greeting the human island residents I could just make out the ghostly glistening outlines of albatrosses by moonlight. But I had to wait until the following morning to really take stock of where I had suddenly landed: Midway Atoll, the largest albatross colony in the world. 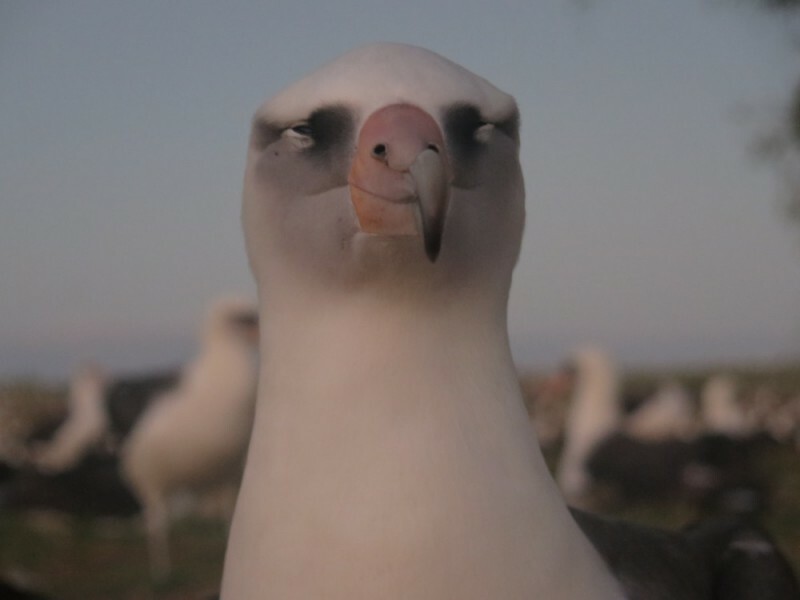 This was my first trip to the Northwestern Hawaiian Islands, but I have been to other albatross colonies before and Midway is most definitely different. 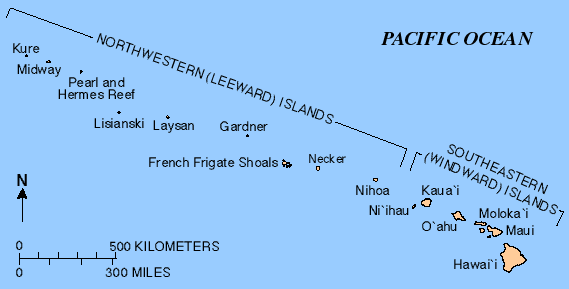 Map of the Hawaiian Islands — Midway is on the left. First of all, it was hot(ish)! Secondly, I was amazed to see albatrosses nesting everywhere. Unlike the southern hemisphere colonies I have visited, the albatrosses aren’t restricted to their section of the island or even nesting as close to each other as possible. Instead there are nests literally everywhere there might be enough loose substrate! Birds nest in the middle of the roads, in the bike racks (bikes are an easy quick means of transportation), along the paths, next to the extremely loud generator, near piles of old equipment, and around buildings. 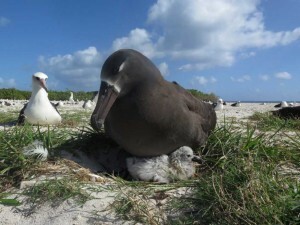 Hawaiian albatross nests are not much to look at compared to the mud pedestal nests of the southern hemisphere mollymawks (see the photos below) and are often made of just enough sand and vegetation to keep the egg in place. There are no aerial predators of these birds, beyond the occasional vagrant peregrine, and certainly nothing that might rival the tenacity of the skuas in the southern hemisphere. Perhaps it is this naiveté that has lead to their willingness to nest anywhere. Black-browed albatrosses, Steeple Jason, Falkland Islands. 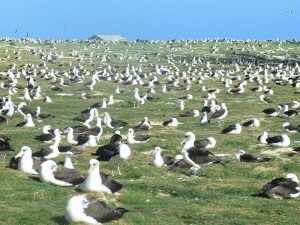 A field of Laysan albatrosses, Midway Atoll. Black-browed albatross on mud pedestal nest. Black-footed albatross and chick, Midway Atoll. It may also be this naiveté that has facilitated the following unfortunate turn of events. Just before I arrived, the USFWS and a crew of volunteers had just finished up the annual albatross count. During their counting sweeps they noticed injured adults incubating eggs. After setting out trail cams, suspicions were confirmed. 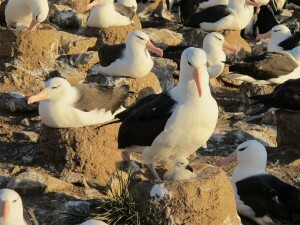 The introduced mice on Midway have discovered that albatrosses are a source of food. House mice are known to prey on albatross chicks on Gough and Marion Islands in the South Atlantic (more information here – warning graphic photos), but to my knowledge this is the first time that they have started eating adult birds. You can read the USFWS announcement here. The plane that I flew out on brought in people, traps, and resources to deal with the situation, but stay tuned as I fear this saga is just beginning. Finally, and on a further less than positive note, I went to Midway fully aware of the problem that plastics pose to these birds and our marine ecosystem, but there is something to be said for seeing it first hand. The chicks were very small when I was there so I didn’t see any direct impacts on them, but see below for photos of carcasses of last year’s fledglings with plastic filled stomachs. 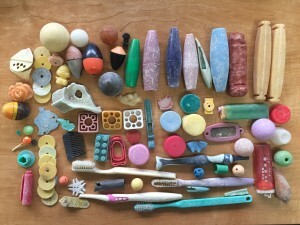 Instead, it was the shear amount of random plastic bits strewn around the island and buried layers deep into the sand that struck me. I learned that sometimes the plastic bits are glow-in-the-dark! 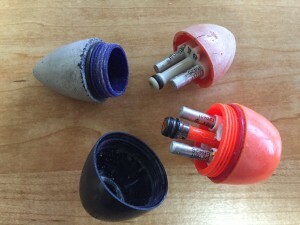 Sometimes fishing lures have batteries in them – I am not sure what they are used to catch – do you know? And toothbrushes are very common. 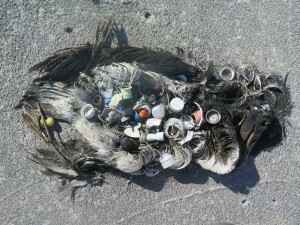 All of the plastic that I saw among the birds arrived in the stomach of an adult albatross. All-in-all the experience gave me renewed inspiration for continuing to reduce the amount of plastic that I use (click here for more information on albatrosses and plastic, and here and here for info on marine plastic pollution in general). I collected interesting pieces to bring home with me (see the photos below), but it is a non-random sampling of what caught my eye. I left many many plastic shards where they were. Fledgling from last year with a stomach full of plastic. Fledglings that didn’t make it off the pier. Fishing lures with batteries inside them. Yes, these were eaten by albatrosses. I have written mostly about the birds, but Midway is full of human history. 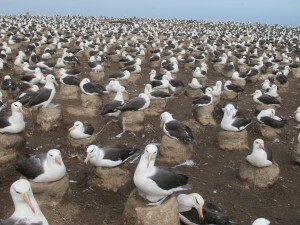 As I biked along the runway, or past the old officer quarters, I often found myself wondering what all these albatrosses have seen over the years and what they might witness in the future. Two weeks was really just a blink-of-an-eye for an albatross that can live over 40 years (or longer like Wisdom the albatross). I was terribly sad to leave such a beautiful place, but I came home with amazing memories, photos, and gigabytes of data that are already giving me a glimpse into the world of albatrosses at sea. Albatrosses on the left, infrastructure on the right. Preening after the mate switch. Bird weighing and tagging equipment. Switching takes some coordination when both birds want to brood the chick. In step, and on their tippy-toes. Fields and fields of albatrosses. Laysan albatross equipped with a GPS data logger. On the way to the runway. Dusk arrival of Bonin petrels. A pair of Laysan albatrosses. Sign for the Midway Mall.